In a league starved for quality quarterbacks, teams will do pretty much anything to secure an all-star signal caller, but sometimes amazing offers are a little too good to be true. The Arizona Cardinals are learning that firsthand after accidentally signing a cheap knockoff Tom Brady that they found on the internet. The Cardinals’ front office first found Tom Brady on www.sportstradenow.free and jumped at the chance to sign who it thought was the five-time Super Bowl champ for just $5,000 a year. Head coach Bruce Arians first had his suspicions raised when it took Tom Brady over two months to arrive at their Glendale facility, but it wasn’t until Tom took his first snap during this weekend’s game against the Houston Texans and immediately started hissing before collapsing in the middle of the field that the team realized it had in fact purchased a low-quality knockoff Tom Brady. Wow. It looks like they should have paid closer attention to the fact that he was listed as an “Indisputable Kickoff Man” rather than quarterback. “We unfortunately can’t undo the decision to acquire Tom Brady from a provider called ‘Guizhou Football Services Depot’ now,” Arians continued. 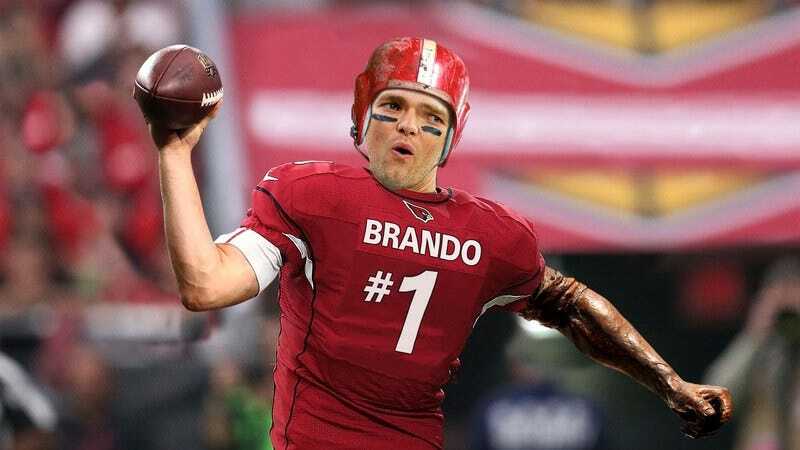 The woeful Cardinals are definitely in a tough spot as they look to replace their bootleg Tom Brady, whose jersey says “Brando” and cannot be removed, with another player this far into the season. Their search for his replacement was derailed further by a crippling computer virus that they got from the Brady trade, and now a hacker called Mo3ius88 is ransoming the Cardinals their own playbook back to them. The Cardinals have even tried to contact the supplier that they ordered Brady from, but the phone number on the website had 26 digits and rang indefinitely when they called, so it seems like they won’t be able to return him anytime soon. It looks like they’ve learned that if something sounds too good to be true, it probably is, but that won’t make this dismal season any easier for Arizona diehards to swallow.